A portable decompression chamber designed for collecting fish in the twilight zone. We’ve only explored a tiny percentage of the deep ocean, and most of its denizens remain alien to the public. Now, a team of researchers is working to change that with a portable device that transports creatures of the so-called mesophotic zone to the surface in one piece—that is, without causing their insides to explode from depressurization. Pressurized sampling devices have existed in one form or another since the 1970s, but these are typically large, cumbersome things attached to ROVs or landers working in the permanent darkness of the deep ocean. 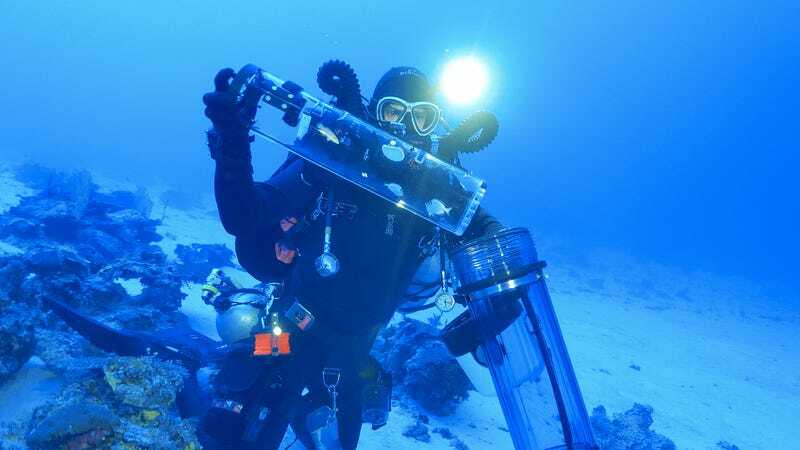 Few are designed specifically for working in the twilight of the mesophotic zone located between 60-150 meters below the surface, a poorly-explored area filled with diverse yet mysterious coral reefs. But thanks to recent improvements in SCUBA technology, some intrepid human divers are now exploring these ecosystems for the very first time. That include Bart Shepherd, Senior Director of the California Academy of Sciences’ Steinhart Aquarium and co-leader of CalAcademy’s Hope for Reefs exploration initiative, which is breaking a lot of the new ground. 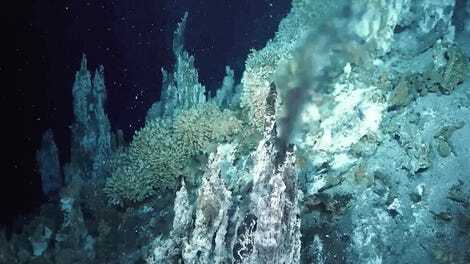 “When we started doing these deep dives, seeing whole ecosystems nobody’s ever seen....I wanted to bring those to the public floor,” Shepherd told Earther. And so Shepherd and his colleagues invented the Submersible Chamber for Ascending Specimens, or SubCAS. Here’s how it works: First, a diver catches fish in a small collecting jar with a spring loaded trap door. After ascending to about 200 feet, that jar is placed inside a larger water filter housing unit, a bubble of air is blown in, and the chamber is sealed. As the chamber is transported to the surface, the drop in pressure causes the bubble to expand, holding the pressure inside the jar constant so that the passengers don’t experience the many horrible effects of barotrauma. The result is that fish can be collected and transported boatside in a matter of minutes, rather than the hours it takes for human divers to safely depressurize. In six diving expeditions between 2014 and 2017, a total of 155 fish (89 percent) survived decompression inside the device. Of those, 143 have been safely flown from remote field sites in the Philippines, Vanuatu, Palau, and Pohnpeito to the Steinhart Aquarium, according to a paper published today in Frontiers in Marine Science. Many are now on display for the world to see as part of the aquarium’s Twilight Zone: Deep Reefs Revealed exhibit. That includes fish that have never lived in aquaria before and several that are brand-new to science. “We’re showing a million-plus people a year these things nobody else will have the opportunity to see, and [using] that as a way to have a conservation about coral reef decline,” Shepherd said, noting that deep reefs, like their shallow water counterparts, are suffering from the effects of pollution, overfishing, and heat-wave induced bleaching events. Andrew Thaler, a deep sea biologist and conservation blogger who wasn’t involved with the study, loved that the device employed a retrofitted, off the shelf water filter. He told Earther via email that the specific depths and pressures it’s designed to operate at, along with its portability, are what makes it novel. “Getting to 6.9Bar [SubCAS’s maximum pressure] is not a particularly high bar, but (and almost certainly because of that), any of the other systems I’m familiar with would be overkill for this application and probably too cumbersome to be useful to divers,” Thaler said. “They can certainly help us learn more about the physiology [of] mesophotic fishes,” she added. Shepherd and his colleagues are using their recently-surfaced specimens to work out the evolutionary relationships between poorly-studied groups of deep reef fish. And they’re gearing up to collect more mysterious ocean dwellers during an expedition to deep reefs in the Indian Ocean in 2019.